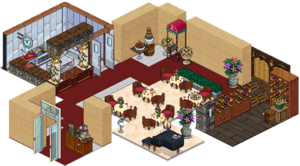 The Romantic Restaurant Bundle was a furniture bundle released on Habbo in February 2019. It was the only new bundle released for the Romantic Restaurant Valentine's Day campaign. The bundle was Romantic Restaurant themed, and also included furniture from Bling, USVA, Christmas Cabin, Kitchen, Summer Bazaar, Haunted House, Wild Wild West, Masquerade Ball, Pirates, Battle Banzai, New Year 2011, Romantique, Starlight Prom, Wedding, Winter Landscaping, Base, Easter Garden, Gift Items, Habbo University, Habbowood, Infected Laboratory, Paris and Vikings. The bundle sold for 199 Credits. Every user who purchased the bundle also received a badge. According to Habbowidgets, 97 Habbos have this badge.